In his classic See It & Sink It, Dr. Craig Farnsworth changed the face of putting. More than ninety percent of PGA Tour players have adopted his method of alignment, including Tiger Woods, Vijay Singh, and Phil Mickelson. His revolutionary, visually based putting system helped Nick Faldo win the 1996 Masters. Now, "the Putt Doctor" takes you to the next level with a book that will change how putting is learned and taught. In The Putting Prescription, the veteran optometrist turned putting guru provides innovative and comprehensive guidance that helps you dramatically improve your putting stroke and lower your scores! 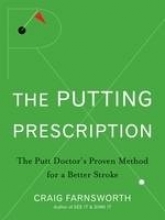 Based on an extensive computer analysis of the putting strokes of elite Tour professionals, top collegiate players, and amateurs at every level of play, Dr. Farnsworth s scientifically based instruction includes nearly a hundred step by step prescriptions that will help you build a reliable stroke, correct mistakes, improve your aim, and much, much more. You ll find plenty of Putt Doctor diagnostic tests to help you define problem areas, and Dr. Farnsworth s prescriptions, practice tips, and drills will help you nurse your putting to the peak of health and make you a master of the green. Complete with more than a hundred photos to guide you toward the perfect setup, grip, aim, and stroke, The Putting Prescription is just what the doctor ordered! SECTION ONE Setup for Success. SECTION THREE The Putt Doctor s Stroke. SECTION FOUR It Is All in Your Perception/Trusting Your Eyes. SECTION FIVE Additional Techniques to Improve Your Stroke. SECTION SIX Pulling the Putt. SECTION SEVEN Pushing the Putt. SECTION EIGHT Knowing Where to Look, What to Look For, and How to Look. SECTION TEN Attitude, Confidence, and the Routine. SECTION TWELVE Drills and Practice with a Purpose. APPENDIX B Training Aids That Are a Must.